What do you really, really want to do for work? Why aren’t you doing it? 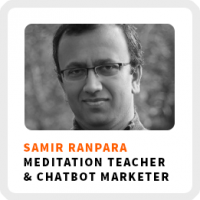 I think Samir Ranpara will inspire you to do the work you really want to do! He became an engineer because he thought that was what was expected of him, but his heart just wasn’t in his work. In 2014, he left his corporate job to start freelancing. Recently, he started a new business building Facebook Messenger chatbots called Chatbot Marketing Center. He wants to help overwhelmed entrepreneurs manage their 1-on-1 communications more efficiently while maintaining their authentic voice. How he made the switch from doing work he thought he was supposed to do to work he wanted to do. How to handle the pressure and skepticism from loved ones when you want to work for yourself. If you want to work for yourself, Samir recommends getting started as soon as possible. Why he was able to make more money creating software than as a freelancer. And he teaches us how to meditate. Ideal work environment: In the morning, when it’s quiet in his home office when his kids are at school. Regains focus by: Taking a break. 90-day goal: Double the revenue for his business. 1) Think of meditation more as a “systematic attention training” as opposed to trying to keep your mind clear. 2) Try feeling your breath, or paying attention to something visually. When your mind wanders, just refocus on what you were paying attention to in the first place.